You cant get much closer to that beach than this apartment; Great location, on the seafront, seconds from the pier and minutes walk from Canoe Lake on way and a short stroll from the Castle and the common. Other amenities are easily accessible by bus/car. 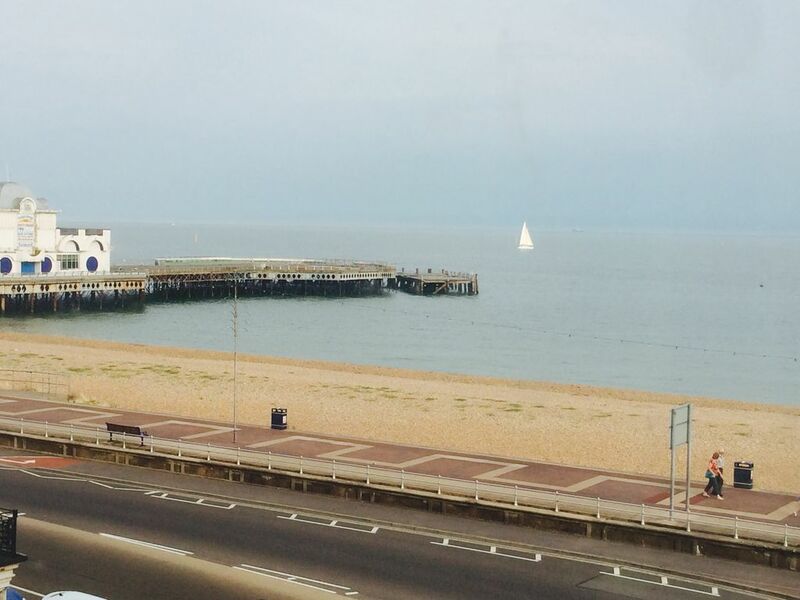 A 3rd floor 2 bed apartment, with sea views Offering one double bedroom and one twin room. The apartment also has a large living room that has a sofa bed that can sleep an additional 2 people, a dining table for 6. It also has a fully equipped kitchen and bathroom with shower over bath. Lovely flat and great location! This was my second stay at this lovely flat with sea views. Jane is great and so helpful! Another enjoyable vacation! I highly recommend this property. Thank you. I was great to host you again, Look forward to seeing you again soon! We stayed for 19 days in March, Jane was great to deal with and we had a very enjoyable 19 days stay in March. The view was outstanding would recommend the apartment. Thank you fior your review. We’re so pleased you enjoyed the apartment and look forward to seeing you when you are back again in the summer. The apartment was lovely . Well equipped, comfortable, clean and quite .On arrival Jane was very helpful provided us with lots of information about Portsmouth. Kinds of Jane to accommodated us with a parking tickets. Thank you for your review. We are so pleased that you fad a nice stay with us. Sorry that you had an issue with the blind and intercom wire, we will get them looked at straight away. We look forward to welcoming you again. Thank you for your review. We are so pleased you had a lovely stay and will get they bathroom door looked at! - Now fixed! We really enjoyed our stay and found the location to be a great base for our Hampshire holiday (Marwell Zoo, Isle of Wight). The property had everything we needed, including toddler-friendly added extras such as a cot bed and high chair. Picking up the key was straight forward and Jane gave us a friendly welcome, with plenty of information about the property and local area. We were surprised to find a number of store-cupboard essentials already in the kitchen which was useful, in addition to fresh milk, bread and a bottle of wine which was a great touch and really appreciated. The property also had a number of toys and games for our daughter, plus TV, DVDs and WiFi. The property was clean throughout and maintained to a good standard. The bedrooms were a good size and we all slept well during our stay. The only slight negative (as non-smokers) was the stale smell of cigarette smoke in the living room which we assume was from previous guests, however the rest of the property did not smell of smoke. It's also worth mentioning that the property is up a number of flights of stairs, which means access isn't the easiest, particularly if you have young kids. All in all, we had a great stay and would have no issues in staying again. Thanks! Many thanks, we are pleased that you had a lovely holiday and look forward to welcoming you back again soon.